Treat Mom to a lovely afternoon of tea, refreshments, and socializing at Avoca. This event is free to all mothers and $5 for all other visitors. Volunteers dressed in period clothing will be serving you and tours of the grounds and mansion are available. Don't miss this popular Mother's Day tradition! Avoca Museum’s annual Member’s Potluck Picnic will be held from 6 to 8 p.m., August 6, on the front lawn of the Avoca mansion. Bring a favorite side dish or dessert to share. Fried chicken and beverages will be provided. In the event of foul weather or hot temperatures, the event will be held inside the house. Please RSVP by July 31 by calling 434-369-1076, leaving a message if necessary. 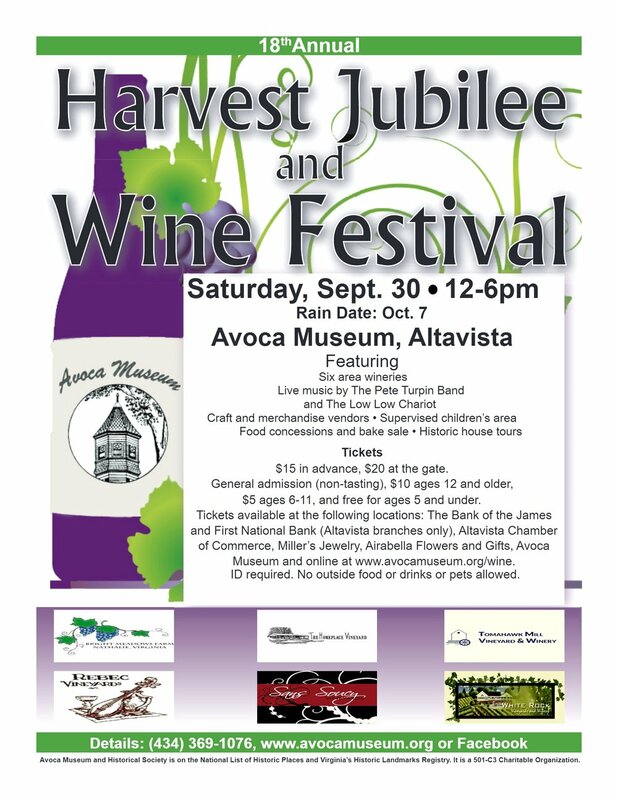 Avoca Museum, 1514 Main St., Altavista, will hold its 20th annual Harvest Jubilee and Wine Festival from noon to 6 p.m., Saturday, Sept. 28 (rain date Oct. 5). The event will include wines from six area wineries, live music from (TBA), local craft and merchandise vendors, food concessions, an adult-supervised bounce house and the annual Avoca bake sale. Tasting tickets are $15 in advance, available at the following locations: Altavista Chamber of Commerce, The Bank of the James (Altavista branch), First National Bank (Altavista branches) Miller’s Jewelry, Airabella Flowers and Gifts, Avoca Museum and online at www.avocamuseum.org/wine. Tickets are $20 at the gate (cash only). Non-tasting tickets are $10 for ages 12 and older, $5 for children ages 6 to 11 and free for children ages 5 and younger. No outside food or drinks or pets allowed. For more information, contact Theresa Boyes at (434) 369-1076 or avocaevents@embarqmail.com. The Wine Festival will be held on this day if the original date is rained out. It’s that time of year again! Join us here at Avoca Museum on October 18 and 19 for Night at the Museum Lantern Tours. This event has become a popular Altavista-area tradition. It’s a family-friendly, educational, and fun offering that’s FREE! You will be led around the grounds and historic buildings of the old Avoca plantation by a lantern-bearing guide in period costume. Along the way, you will hear stories from actors and actresses portraying the people who made history on these very grounds! Don’t miss this interesting and entertaining family event! All you have to do to get in on the fun is to register in advance by calling Avoca Museum at 434-369-1076. Tours are offered on Friday, October 19 at 6:00, 6:30, 7:00, 7:30, and 8:00. Once you have registered in advance, remember to wear comfortable walking shoes and carry a small flashlight as visitors will be walking over slightly uneven ground at points. Also, Avoca Museum recommends that guests bring an umbrella if rain is in the forecast. If it does rain on the evening of performances, all actors will be indoors but groups will step outside to travel from one building to another. The museum’s Gift Shop will be open for shopping and cash concessions will be offered with proceeds going to benefit the museum’s education programs. Remember, register in advance for your desired tour time at 434-369-1076. We hope to see you at the museum soon! It’s that time of year again! 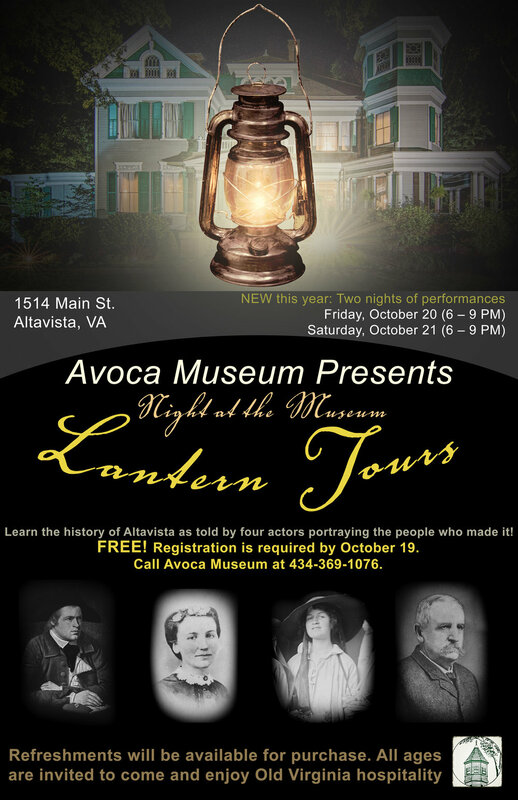 Join us here at Avoca Museum on October 19 and 20 for Night at the Museum Lantern Tours. This event has become a popular Altavista-area tradition. It’s a family-friendly, educational, and fun offering that’s FREE! Visit Avoca Museum to share in the Joy of the Season! The event will feature self-guided tours of the historic mansion and outbuildings (docents will be available to answer questions). Enjoy Christmas-themed refreshments including hot apple cider. Each room in the mansion is decorated by volunteers. If you have never been to Avoca, this would be the perfect opportunity to see the house in all of its splendor. Admission is $5 for adults and teens, $2 for children ages 6-12, and no charge for ages 5 and under. Bring your friends and family to help us celebrate the 2019 opening of Avoca Museum. This free and family-oriented event is a fun and interesting way to re-acquaint with this lovely historic place. If you have never visited Avoca, this would be your golden opportunity to do that. The event is free and is offered in appreciation for the Town of Altavista’s support of the museum. House tours, demonstrations by living history interpreters, refreshments, beverages, and adult drinks are all a part of the celebration. Come one, come all! House tours last 11 AM – 3 PM. At 3 PM, a fascinating lecture by Michael Johnson on the topic of Paleo-Indian settlement in this area of Virginia will be offered at no charge to the public. You won’t want to miss this opportunity to get “up close and personal” with local history. The Member’s Christmas Party will be held from 6 to 8 p.m. Monday, Dec. 10 in the Avoca mansion. The event includes heavy hors d’oeuvres, wine and beer, musical entertainment and the culmination of the silent auction, the proceeds of which benefit Avoca’s educational programs. Please RSVP by Monday, Dec. 3 by calling 434-369-1076, leaving a message if necessary. Christmas at Avoca will be held from 1 to 5 p.m. on Dec. 1, 2, 8 and 9 in the mansion and on the museum grounds. Each room of the Victorian home will be decorated by Avoca’s volunteers and members of the Altavista community. The event features musical entertainment, refreshments, visits by Santa, a bake sale and a silent auction with all proceeds benefitting Avoca Museum’s educational programs. Admission is $5 for adults, $2 for children ages 6 to 11 and free for ages 5 and younger. Tickets are available at the museum gift shop the days of the event. The Volunteer Appreciation Dinner will be held at 6 p.m. Tuesday, Oct. 23 , 6 p.m. in the parlor/music room of the Avoca mansion. The event will include a catered meal and the presentation of awards.Please RSVP by Tuesday, Oct. 16 by calling 434-369-1076, leaving a message if necessary. The museum will be closed all day for the festival preparations. Avoca Museum welcomes descendants of the Lynch, Dearing, and Ward families as well as the descendants of those who were enslaved at Avoca and Otterbourne Plantations. This event will be held on July 7, 2018. It will feature a catered buffet-style lunch. Please call Avoca Museum for registration information. The cost to attend is $20/person (with an additional $10 fee for those wishing to purchase t-shirts). Features decorations, live music and refreshments.